Once a week I visit my personal trainer, the brilliant Karen Marshall. She’s done wonders for me – if you’re in my area and want to get fit, talk to Karen. She’s also very excited about me running the Marathon. So she’s been taking me, and some others, out for testing Saturday morning runs. It’s great, because you inevitably push yourself (and get pushed) much harder when there’s someone else there who knows what they’re doing. 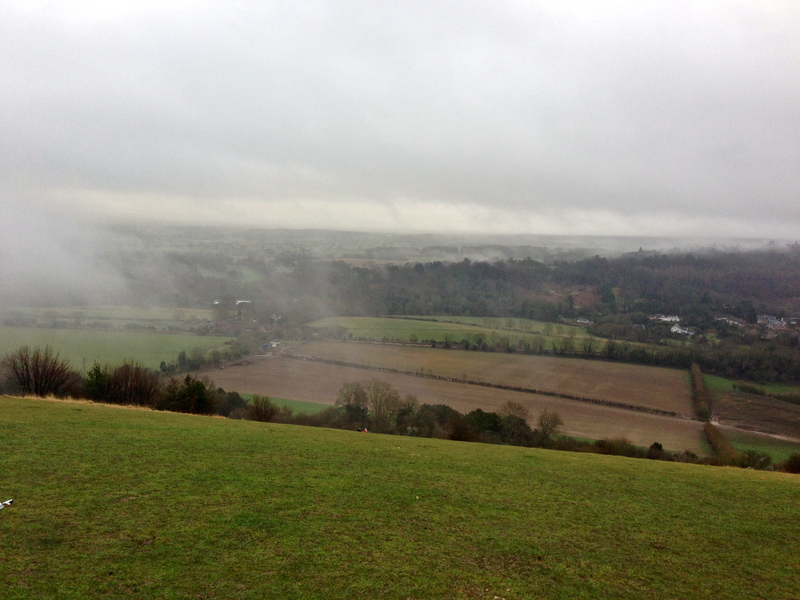 Which is why, on this dank, foggy January morning, I agreed to run up Box Hill. 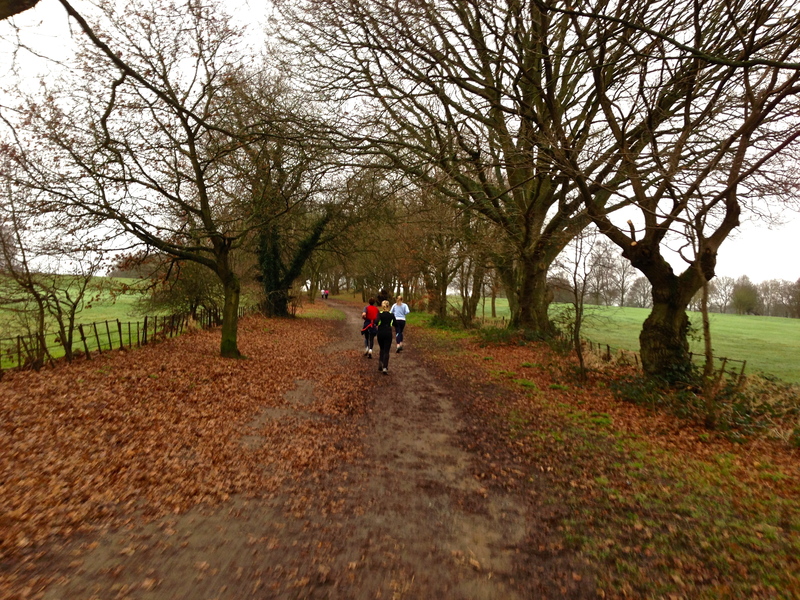 We started on the edge of Dorking, limbering up by running a couple of miles over to, and across, Betchworth Golf Course, and then around Brockham. 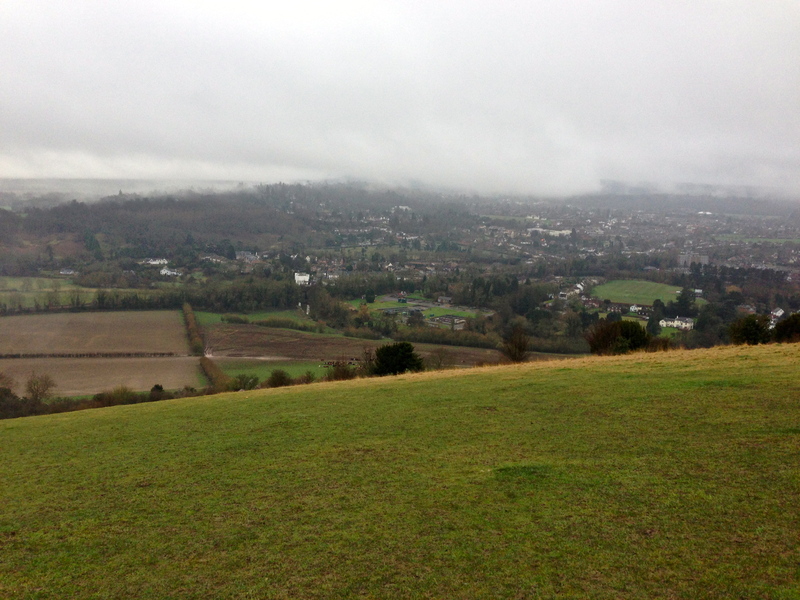 Then we cut back across the A25, and over the hard brown fields towards Box Hill itself. By this point, even just heading towards the hill, I felt knackered. And this is why it’s so good running with Karen – I wouldn’t normally even attempt a run like this, simply because I wouldn’t believe I could do it. But if Karen believes I can, so do I.
Amazingly, it turned out that I could. Even after Karen led us to a narrow, rocky path that went straight up the side of the hill – none of this gentle zig-zag nonsense. I can’t claim to have run all the way up it. Some of it was more like climbing. But we got a pretty high pretty fast, and I was pleased – and relieved – by how well I managed to carry on after that. I mean, I’m never going to catch these women. Karen is phenomenally fit, and only stays within my sight because she’s a kindly soul. Wendy (not my wife, those who know me – another Wendy) has been running for something ridiculous like 20 years, and simply vanishes off into the distance. Especially in fog like this. And Jan, to whom I’m probably closest in fitness (and who’s also doing the Marathon), still stays well ahead of me. But none of that matters. What matters is that only a few months ago even the idea of running made me feel tired. 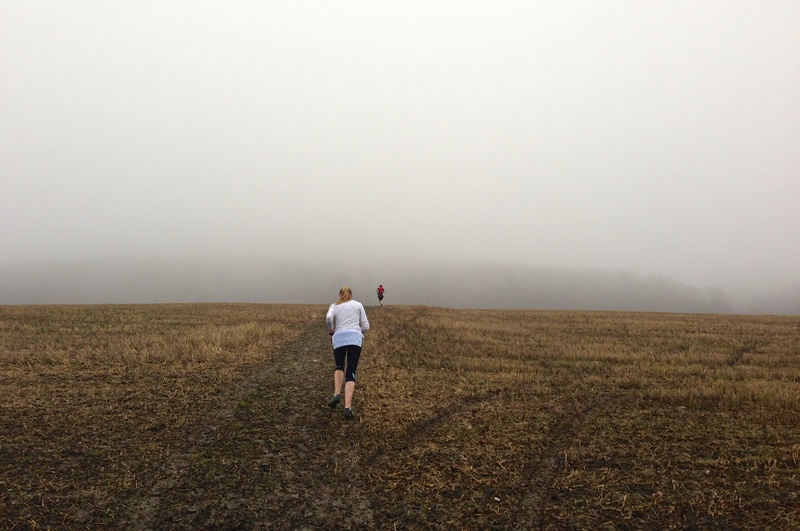 The last time I did anything remotely like this was at school, and the term ‘cross-country running’ still conjures miserable memories: foggy, damp days of trudging heavily through puddled mud-dumps, with aching lungs, aching limbs and a throat full of phlegm. It’s fair to say that I failed to perceive an upside to the enterprise. Of course, it’s just the same now. The limbs and lungs still ache – far more, in fact, 30 years on. I still cough nasty, stringy gobs of phlegm into the hedgerows (or, just as often, all over my arm). But the attitude is transformed. Now, I want to do it. I even (horrors) enjoy it. Sadly, it took 20-odd years of sitting on my arse in an office (when I wasn’t sitting on my arse in a pub, or the living room) to become unfit enough to feel I had to do something about it. Only then did I discover I actually liked it. Depressingly, it all goes back to school. I learnt two critical lessons in PE: firstly, that some people had an innate gift for, and understanding of, sports; and secondly, that I wasn’t one of them. Once you’ve learnt you stink at something, it’s a very hard lesson to unlearn. Especially if you’re not one of those naturally predisposed to standing inadequately dressed on a frozen field once or twice a week, and being attacked with sticks. Thankfully, my own children are getting a much better start in sports than I did. I went to watch Tom play a rugby match recently, and it was uncannily like watching my own eight year-old self: a bit nervous, not naturally co-ordinated, happier near the sidelines, all of that. But there’s a critical difference: Tom’s on the rugby field because – wonder of wonders – he asked to be on the team. And his teacher is interested in nurturing that enthusiasm, not just focusing on the obviously gifted. What do you know – Tom’s improving rapidly. Anyway, I digress. We made it up the hill, and along the ridge, making a final, headlong descent down the steep slopes to the Burford Bridge Hotel. By the time I got to the foot of the hill, my right knee was complaining loudly. It does that a lot these days. Something must be done. But even so, I made it back along the road to our starting point at the Dorking Cricket Club ground. Running, not walking. 8.1 miles in an hour and 35 minutes. Not bad, considering all that climbing. This entry was posted in Running and tagged box hill, children, education, Running, school, sports, surrey on 5 January, 2013 by reedwords.